The government of Nehru established many institutions of higher learning, including the All India Institute of Medical Sciences, the Indian Institutes of Technology, the Indian Institutes of Management and the National Institutes of Technology. During cold war, he pioneered the policy of non-alignment and co-founded the Non-Aligned Movement of nations professing neutrality between the rival blocs of nations led by the U.S. and the U.S.S.R. Nehru signed the Indus Water Treaty in 1960 with Pakistani ruler Ayub Khan to resolve long-standing disputes about sharing the resources of the major rivers of the Punjab region. He formulated the Pancha Sila (Five Principles of Peaceful Coexistence), which was the basis of the 1954 Sino-Indian border treaty. But in later years, Nehru's foreign policy suffered through increasing Chinese assertiveness over border disputes and Nehru's decision to grant political asylum to the 14th Dalai Lama. In 1961 Nehru authorized the Indian Army to liberate Goa from Portuguese occupation after years of negotiations, and then he formally annexed it to India. The first India-Pak war was fought over the princely state of Kashmir and Jammu from 1947 to 1948. After independence, the princely state of Kashmir and Jammu came under pressure from both India and Pakistan to agree to become part of one of the newly independent countries. However, the Maharaja of Kashmir, Hari Singh (Pakisthan claimed that Hari Singh is not the Manaraja, but just an appointee by British) tried to avoid accession to either country. As Pakistani tribes attached Kashmir, the Maharaja asked for Indian military assistance. Nehru set a condition that Kashmir must accede to India for it to receive assistance. The Maharaja complied, and the Government of India recognized the accession of the erstwhile princely state to India. Indian troops were sent to the state to defend it. By the end of the war, Pakistan was able to acquire roughly two-fifths (Gilgit and Baltistan territories ) of Kashmir, while India maintained the remaining three fifths of Kashmir, including the most populous and fertile regions. From 1959 Nehru adopted the "Forward Policy" of setting up military outposts in disputed areas of the Sino-Indian border. In 1961 India set up 43 outposts in territory which were not previously controlled by India. China attacked some of these outposts, and thus the Sino-Indian War began, which India technically lost, but China gained no territory as it withdrew to pre-war lines. The war exposed the weaknesses of India's military, and Nehru was widely criticised for his government's insufficient attention to defence. In response, Nehru sacked the defence minister Krishna Menon and sought U.S. military aid. 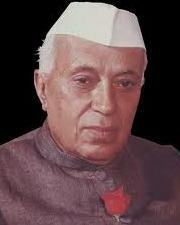 By 1963 his health Nehru died on 27 May 1964 and the cause of death is believed to be heart attack. Glimpses of World History, was written by Nehru in 1934, is a panoramic view of the history of humankind. It is a collection of 196 letters on world history written from various prisons in British India between 1930–1933. The letters were written to his young daughter Indira, and was meant to introduce her to world history. Toward Freedom is an autobiographical book written by Nehru while he was in prison in 1936. He wrote the book to explore how and why he had ended up taking the path of civil disobedience that in turn led to his imprisonment. Nehru wrote The Discovery of India during his imprisonment in 1942-1946 at Ahmednagar in the Ahmednagar Fort. He was jailed for his participation in the Quit India movement and he used this time to write down his thoughts and knowledge about India's history. The book is widely regarded as a classic in India, and provides a broad view of Indian history, philosophy and culture, as viewed from the eyes of a liberal Indian fighting for the independence of his country. In this book Nehru tries to study the history of India starting from the Indus Valley Civilization, and then covers the country's history from the arrival of the Aryans to government under the British Empire. The book was dedicated to the Prisoners of Ahmednagar jail. Tryst with Destiny was a speech made by Nehru, to the Indian Constituent Assembly, on the eve of India's Independence, towards midnight on 14 August 1947. It is considered to be one of the greatest speeches of all time and to be a landmark oration that captures the essence of the triumphant culmination of the hundred-year non-violent Indian freedom struggle against the British Empire in India. for no nation can be great whose people are narrow in thought or in action."